Almost 3 years ago, I basically and painfully disappeared from the radar of most of my colleagues, close friends and even family members. Went into a nomadic life just to prime myself up for a battle that I wasn’t initially prepared for – a battle against The Powers That Be. In the space of 6 months, I had to remember as much as I could about my past lives; train under the most demanding, benevolent, higher dimensional guides who became my mentors and now, my friends. It was a role I assumed not without a fair amount of drama, actually being metaphorically dragged kicking and screaming and sometimes crying to this role I had to assume – and the inevitable showdown, a direct confrontation with a Reptilian that makes the stuff of some of your nightmares. Well, how do you actually confront a Reptilian, in person? 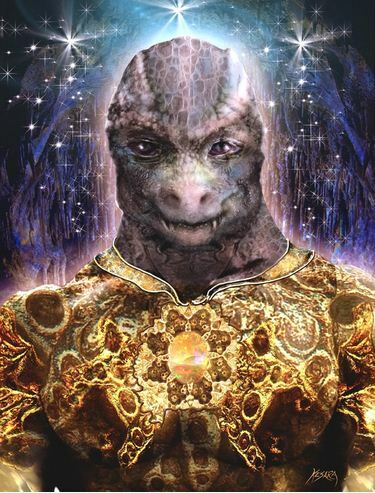 It was harrowing enough to read online about encounters with Reptilians by some lightworker who lived to tell the tale. But to meet them in person – that merits a post – or maybe a book later on by me ;). What I’d like to recount to you now is how I communicated with a “Positive Reptilian” recently and how it has impacted meJ. Before this encounter, I already had some communications with the Reptilians, which we were playfully calling “The Other Side” or more often, the “Rs”. One I had written about before was Krisolis, who had helped me recover from a really bad hex which was sent to me by a really bad warlock. Krisolis is now one of my warmest and closest friends from the higher dimensional planes :). Krisolis shows himself to me as a roly-poly green dragon with a big paunch and a penchant for grilled chicken. Not all of them look this way (some of them can shapeshift at will, by the way, and Krisolis has this ability). I learned a lot from Krisolis — his lineage, his friends, his job before he transformed into a positive reptilian and how he decided to become a “positive R”. So this new encounter of mine is called Akah. I had learned about Akah about a few days before the recent summer solstice (June 21). I had read about him before through the writings and illustrations of the psychic artist Christine Kesara Dennett. Ms. Dennett intuitively draws the images of extraterrestrial beings who communicate to her through her clients. Akah was one of those who was identified and drawn before by Ms. Dennett (see the photo and write-up here http://extraterestrials.blogspot.com/search?q=akah ). And so when I was recuperating from an unusual bout of illness before the summer solstice, I managed to have a conversation with Akah. Normally, the communications come very quickly and without fanfare. I usually feel this “tingling” in my nose when a higher dimensional being would like to speak to me. And so I saw or perceived Akah. He looked very regal and wise. His Reptilian eyes had the look of someone who had been through a lot and learned a lot through experience, some very painful. But he is still friendly, benevolent and helpful. Akah was not just a common R. He is a military general, a commander but now mostly on a consultancy basis. I found out that he had been in countless battles for his race in several star systems eons ago. Some of them were indiscriminate takeovers of other races’ home worlds — and outright bloody. Commander Akah said he was part of the 1st initiative of the Reptilian race to conquer other planets and star systems in search for gold to support their home world’s atmosphere. He assured me that prior to his battle experience, he and several others of his kin were living peacefully in their star system/s. From what I was told, this current home of the Rs was not their original home; it was actually thousands of light years away. Only after they found gold here on Earth and other nearby star systems did they managed to move and occupy the Sirius and Alpha Draconis star systems. Commander Akah said that initially, the Rs were looking for gold in several star systems because their home world’s atmosphere needed it. Initially, it was a peaceful hunt for gold. They would request these races to allow them to mine some gold and take it with them to their home system. Unfortunately, a lot of these planets didn’t allow them to take or mine some of their gold. It was after they faced disappointment after disappointment in securing some gold even when they offered to buy it that they decided to “invade” the peoples they encountered. This was something that Commander Akah admitted to me was a disheartening and sad decision that they made. And a fantastic plunder it was! Akah said that for thousands of years, this was their work — to plunder star systems and their planets for gold. Until one day, while looking and listening to battle and takeover reports from his officers, he couldn’t stand it anymore – to see such carnage being done. It was something similar to General Ashoka, widely known as an incarnation of a Boddhisatva, when he pillaged several cities and regions of India and surrounding countries that one day, he looked at what he had done and was repulsed by it. So repulsed was General Ashoka at the carnage he had committed that he vowed to be a benevolent ruler of India thereafter and to stop killing people and even animals for the sake of Buddhism and peace in his reign and with his neighbors. After thousands of years (yes, they can live for thousands of years), Akah finally left his post in the battlefield and vowed not to wage war with humanity or any other species. He retired from the service, occasionally being consulted for his military expertise in battle. But, there was still 1 thing he had to do . . .
A week before summer solstice, I was having a fever of sorts. Feeling really weak, I wasn’t feeling up to working but I still did. And this was when I got the communication from Akah, for the very 1st time. I knew then that something was up – a strange feeling of energy that permeated the atmosphere those days. It was like the wind and the trees and even my elemental friends were expecting something. Commander Akah certainly didn’t mince words when his image came through in my mind. He said there was a “great download of energy” starting 2 weeks before the summer solstice. This is the planet – Gaia, already raising its frequency preparatory to entering a new phase of evolution, the entrance to the 5th dimension. At that time, I didn’t know that a Grand Cross of Venus, Saturn, Neptune and Jupiter was occurring among the constellations. Every major Grand Cross that has ever occurred on the planet has been accompanied by major movements of energy. Now energy is neither good nor bad. It just is. It is the beings or entities who receive this energy who make it good or bad depending upon their prime motivation. And so with this particular Summer Solstice Grand Cross, Akah communicated to me a message (this is just a summary because I usually don’t take down notes but just remember the important points). Continuation in the next blog post: Akah and what was his message to me. This entry was posted in multi-dimensional worlds, Reptilians, shamanic healing, Shifting the timeline and tagged 5th dimension, Ashoka, benevolent higher dimensional beings, extraterrestial beings, Gautama Buddha, lightworker, Raising our frequency, Reptilians. Bookmark the permalink. But they changed too…things changed. and it started just after they took over my home. I was told this story both from the reptillian view as from the survivors view.. But hey nobody wants to hear it. Thank you for your comment Ava, and apologies for my tardy response (see my latest post on the reason why I was late in responding). Yes, it’s great to know from the comments here that others have also their experiences with positive or negative reptilians. Like what I said in my post, even negative Reptilians also go through a process of evolution. It is the normal cycle of development. Each individual, each entity has “free will” to follow the good path or the bad path. That is why I firmly and honestly believe that in time, which may be years, decades or even a century, the negative reptilians will also evolve into peace-loving entities like the rest of our Universal brotherhood. As I have always been referring in my posts, all of us are the same under One Creator. Namaste Ava and have a most blessed life :)! P.S. Have you ever written about your experiences with the Rs too? Do you have a blog about that ;)? Would luv to read about it :)!